Burbank, California-May 2011 - Graphics One, LLC, an international distributor dedicated to providing innovative, high quality products to digital imaging professionals, and OKI Data, the world's leading manufacturer of LED printers, announce a national partnership in order to provide partners with world class printing technology and full-service solutions. 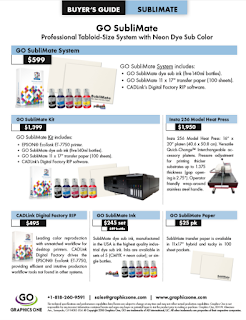 Combining cutting edge technology and value pricing,Graphics One and Oki Data bring to you a full line of proColor printers for transfer, small format signage and color separation for screen printing to be distributed by Graphics One. This exceptional line of products includes the launch of the OKI proColor 920 WT, an impressive high speed tabloid/A3 digital color printer with white toner. The proColor 920 WT LED printer supplements the already impressive OKI proColor Series line of printers. The inclusion of a revolutionary white toner for printing on dark, colored, transparent and transfer media puts the 920 WT in a class of its own. User-controlled print sequencing offers the ability to print white first as an undercoating on colored paper and signage, or to print white last as an overcoat on transparent and image transfer media. Such features and capabilities are advantageous, if not essential, in apparel imaging, graphic arts and production environments. The pro920WT is the lowest cost white toner solution product available to the graphic arts and production market. At a list price of $7,495 and with printing speeds enabling over 1,000 12"x18" images per hour, the pro920WT gives users unprecedented short-run capabilities at an affordable price. High Definition (HD) Color printing technology with up to 1200 x 600 dpi resolution to deliver clear, sharp text and graphics whether on ordinary paper, dark colored stock, custom or specialty media offers an unbelievable value package. The OKI proColor 920 WT is available exclusively through Graphics One with an industry leading one year On-Site Warranty. The proColor 920 WT, proColor 910 and proColor 930 are available immediately for purchase from Graphics One. The proColor 920 WT begins shipment this summer. Please visit: http://www.graphicsone.com/oki-procolor-920-wt.html for more information on the 920 WT.